May's Cabinet Denies "Second Referendum" Rumors As MPs And Traders Wonder: "What On Earth Do We Do Next?" After the Brexit-related developments of the past few days, Prime Minister Theresa May will have a lot of explaining to do during what's likely to be another contentious round of PMQs Monday morning. Following reports that members of May's cabinet have been reaching across the floor to discuss the feasibility of calling a second Brexit referendum (what supporters have shrewdly branded as a "People's Vote"), members of the prime minister's government have scrambled to make clear that they have absolutely zero intention of resorting to such a callous disregard of the popular will (despite the fact that it's probably the only sensible option available to May if she wants to avert a hard Brexit). The logic behind a second vote makes sense: Either the people will deliver a popular mandate for MPs to accept Theresa May's deal, or they will cancel Brexit all together (because thanks to "Project Fear", the prospect of allowing a 'no deal' Brexit is just unthinkable. Minister for the Cabinet Office and PM May's de facto deputy David Lidington denied a Sunday Times report about his back-door negotiating for a second referendum, warning in a tweet that a "People's Vote" would only risk further harm to the public consciousness. Meanwhile, Trade Secretary Liam Fox appeared on the BBC to advocate for a vote in Parliament on alternatives if May's deal is defeated in a vote that's now expected to happen before Christmas. Since the notion that May's supremely unpopular deal has no chance of passing has been widely expected for weeks, this would effectively delegate the decision on whether to hold a second referendum, or not, to MPs. Fox said he "wouldn’t have a huge problem with Parliament as a whole having a say on what the options were" and the votes could be without specific instructions, or unwhipped, so lawmakers wouldn’t have to vote along party lines," making Fox the first Brexiteer to advocate such a move. "It wasn’t the government given an instruction in the referendum, it was Parliament," he said. "They gave us an instruction and its time Parliament carried it out." "It’s not one that cabinet has discussed yet, but when you look at the options that we have, we’ve got to recognize there are a limited number of real-world options here," he said. Education Secretary Damian Hinds has also suggested "flushing out" the levels of Parliamentary support for different Brexit options although he insisted that there was no majority for any of them. Lib Dem MP Tom Brake (a backer of the pro-remain "Best for Britain" campaign), said that "when even Dr. Fox does not rule out free votes and encourages the idea of indicative votes in Parliament, the Brexit project is clearly in jeopardy." But current members of the government aren't the only ones out there stirring the pot while May struggles with her impossible dilemma. On Saturday, the prime minister blasted her predecessor, former Labour PM Tony Blair, who has been openly advocating (see this Reuters piece) for another vote. May accused him of "undermining Brexit", per the BBC. "For Tony Blair to go to Brussels and seek to undermine our negotiations by advocating for a second referendum is an insult to the office he once held and the people he once served." One idea, now floated by three cabinet ministers in public, and others privately, is a series of so called "indicative votes". These would flush out Parliament's view on a range of options which could include different models of Brexit: something akin to Norway's relationship with the EU for instance, or Canada's looser one. Another referendum and no deal are other possibilities. Some ponder doing this before the vote on the prime minister's deal, in the hope it highlights that her plan is the only workable Brexit deal achievable now. "Things are not as hopeless as they look," one cabinet minister told me. It's important to remember that, if Parliament does back a clear Brexit alternative - like a Canada-style or Norway-style trade deal - it would still need to be accepted by the EU for the UK to avoid a hard Brexit. So far, the EU has given no indication that it would any deal other than the one that has been negotiated with May (though a "secret alliance" of MPs and EU officials have reportedly been working to bolster support for a Brexit 'plan B'). 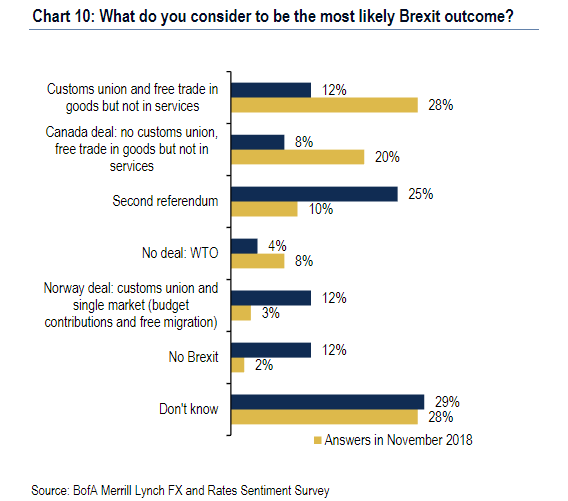 Given that opting for another deal would grant no guarantees of May finding a workable alternative, a second referendum, or Article 50 delay, are the most secure alternatives for stopping the UK from crashing out of the EU and reverting to WTO rules come the beginning of Q2.